This is Johnson and Ward's beautifully hand colored 1863 map of New York State. 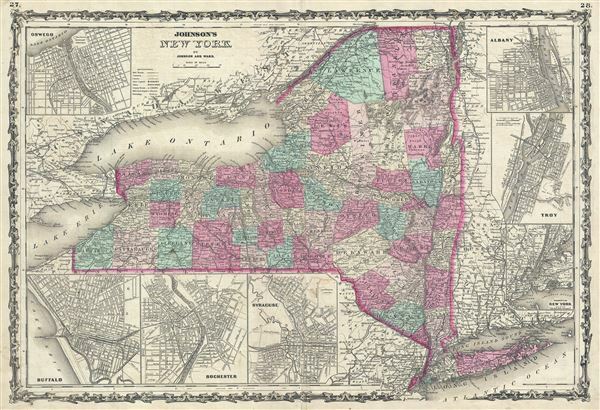 This rare map offers a fascinating snapshot of New York during the American Civil War. It covers New York in full with bold and dramatic color coding according to county, also details transportation routes, especially roads, railroads, and canals. Includes seven inset city plans detailing Oswego, Buffalo, Rochester, Syracuse, the environs of New York, Troy and Albany. Noting that a good number of his subscribers were from New York, Johnson made replacing the single page map of New York State he inherited from Colton was one a top priority. Johnson introduced this large folio map in the 1861 edition of his atlas and it went through minor annual updates through 1866 when it was again redrawn. This map features the strapwork style border common to Johnson's atlas work from 1860 to 1863. Published by A. J. Johnson and Ward as plate nos. 27-28 in the scarce 1863 edition of Johnson's Family Atlas. This is the second edition of Johnson's atlas to bear the 'Johnson and Ward' imprint. Very good. Minor wear and toning along original centerfold. Minor spotting at places. Text on verso. Rumsey 0352.021 (1864 edition). Philips (Atlases) 843.